Toyota has released more information on the Hybrid-R Concept and the new teaser image reveals it’s a Yaris hybrid. 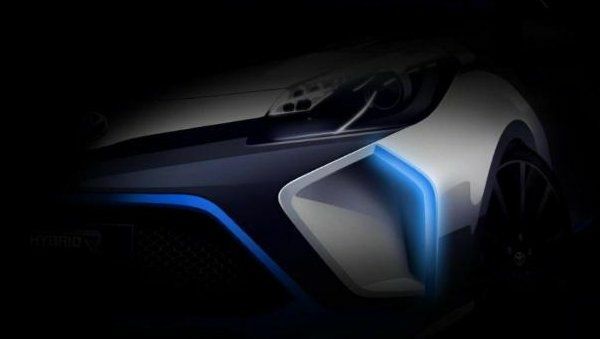 Toyota won’t be able to keep a secret very long as a digitally enhanced image of the teaser reveals the Toyota Hybrid-R Concept is a Toyota Yaris hybrid. We also know it will be unveiled at the 2013 Frankfurt Motor Show next month. Toyota did say the new Hybrid-R Concept would be based on a current production model, but did not reveal which one. And we know it will be a high-performance model with more than 400 horsepower. A digitally enhanced image of the teaser by AutoCar reveals the new concept hybrid will be a Toyota Yaris. Up until now, only the Hybrid-R badge was shown. Toyota has been a leader in hybrid technology around the globe and the new Yaris hybrid will be an exciting ride. Toyota did tell us the new Hybrid-R Concept will be equipped with a powertrain that features similar technology that is used by Toyota Racing’s TS030 Hybrid race car in the FIA World Endurance Championship. That is good news because the new technology is on the leading edge and is being proven on the race track. As with most automakers, Toyota uses technology developed on the race track to design cars that eventually make it to production with the insights and knowledge learned from the race cars. Toyota Motorsports GmbH (TMG) in Germany has been working on the TS030 Hybrid race car for a number of years now. The car uses a regenerative braking system that captures energy and then sends power to the rear wheels. Other automakers like Audi with the R18 e-tron Quattro, send power to the front wheels. We can learn a lot from Toyota Motorsports GmbH and what they have planned for the new Toyota Yaris hybrid. It will be built for fuel-efficiency, but it will also be designed for performance. Toyota tells us it will feature a high-power internal combustion gas engine and will be mated with electric motors to achieve a maximum power output of more than 400bhp (298kW). This will make the Yaris hybrid one powerful compact car. Compare that to the current Yaris that features a 106 horsepower four-cylinder engine, and we can see this new Yaris hybrid car will be a lightning fast performance car. Toyota has aspirations of upgrading their lineup to include more performance cars, and the Yaris hybrid will come equipped with a dual mode control that will allow the car’s high-performance to be tailored to suit either road or racetrack. The current Yaris already features a sporty SE model with five-speed manual transmission, sport-tuned suspension, and quicker-ratio steering. We can expect the Yaris hybrid to come with even more performance upgrades to handle the more than 400 hp. We can learn much from Toyota Motorsports GmbH and the Toyota Racing 2013 TS030 Hybrid. The team has fine-tuned the powertrain, chassis and aerodynamics to improve power, efficiency, management of component usage and reliability. They will bring the knowledge learned and apply it to the new Hybrid-R Concept which we now know will be a new high-performance Yaris hybrid. Stay tuned.